Everything was just great. My son just loved the pool and had a hard getting him to move out of the pool area. Very courteous and helpful manager Maria who took care of every small details. Will definitely recommend this place to all my friends. Nice light big apartment with two bedroom and two bathroom on 8th floor. Big and colourful poolarea. Close to beach, restaurants and 7eleven. We first only got one key, but after pushing we got another key. Big balcony with morning sun. In the evenings you could watch thai people playing football. When asking for more things like towels, cleaning equipment or mattress to extra bed she fixed this in 1-2 days. This place safe and clean. It's not far from beach. There is swimming pool. Children love it. Clean place. Nice swimming pool. Children loved it. Room was clean. The owner was helpful (especially her husband was very helpful). The pool was so big and great for kids. They were maintaining the pool with salt which was safe for my kids. Nice and cheap restaurants and massage shops just around the flat. The beach was within 5 minutes walking distance and you can also take the cheap local buses over there which is going to everywhere in Pattaya. Det aller meste var tilfredsstillende. Vi kommer tilbake igjen. Отличное месторасположение и территория, В номере есть все необходимое в быту: стиралка, утюг, фен, микроволновка, чайник, электроплита. Управляющие Реагируют на обращения достаточно быстро. 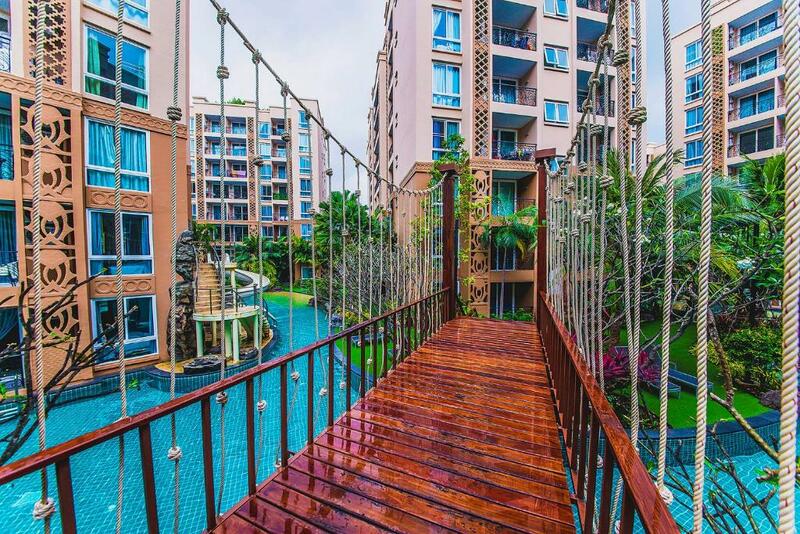 One of our top picks in Jomtien Beach.Located in Pattaya South, 3.1 mi from Walking Street Pattaya, Atlantis Condo Jomtien Pattaya features a water park style outdoor pool with sliders and waterfall surrounded by lush tropical garden and fitness center. Underwater World Pattaya is 1.1 mi from the property. Free WiFi is offered . All units feature a flat-screen TV, a microwave, and a refrigerator. There is a private bathroom with a shower in each unit. Towels and bed linen are provided. Outlet Mall Pattaya is 1.7 mi from Atlantis Condo Jomtien Pattaya, while Bali Hai Pier is 3.1 mi away. The nearest airport is Utapao-Rayong-Pataya International Airport, 17 mi from the property. For meals, there are a number of dining options available within a 5-minute drive of the property. When would you like to stay at Atlantis Condo Jomtien Pattaya? This apartment features a kitchenware, stovetop and air conditioning. This apartment features a electric kettle, kitchenware and sofa. ATLANTIS CONDO RESORT new class condominium on Jomtien Beach Resort. Designed by leading landscapers Thailand, who have created a unique environment on the territory of the Resort. Fully furnished 1bedroom apartments and 2bedroom is about 300 meters away from Jomtien Beach. Guests can now enjoy a themed water park in the vast territory of 2,600 sq.m. ! 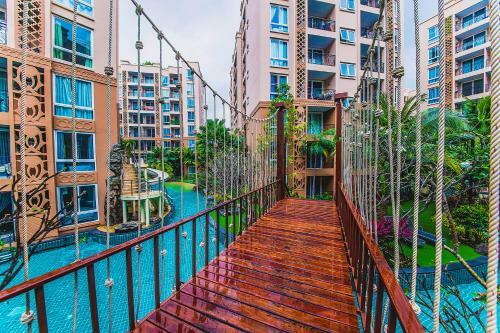 It is an exotic tropical garden surrounds the swimming pool, natural waterfalls, sloping edge at the beach style, wooden bridges and old lanterns create a charming atmosphere in the evenings. Adults can enjoy the luxury of a jacuzzi and waterfalls, and a fully-equipped children's playground and children's water slides. Amenities include all the apartments equipped with a flat-screen TV, dining area with kitchen and refrigerator. Linen is included in the price. The project has a 24-hour security making it safe and reliable. electronic access system (card), CCTV (CCTV). Prior to Central Festival Pattaya Beach shopping center can be reached within 20 minutes. Distance from Outlet Mall Pattaya is 5.3 km, At 7 km from Bali Hai Pier. The nearest airport Utapao-Rayong-Pataya International Airport, 27 km away. House Rules Atlantis Condo Jomtien Pattaya takes special requests – add in the next step! Atlantis Condo Jomtien Pattaya accepts these cards and reserves the right to temporarily hold an amount prior to arrival. Please inform Atlantis Condo Jomtien Pattaya of your expected arrival time in advance. You can use the Special Requests box when booking, or contact the property directly using the contact details in your confirmation. A damage deposit of THB 3000 is required on arrival. That's about 93.75USD. This will be collected by bank transfer. You should be reimbursed on check-out. Your deposit will be refunded in full by bank transfer, subject to an inspection of the property. Had a problem communicating when I arrived as staff only spoke Thai. Wasted a lot of time to sort things out. Finally had call bookings.com office (a U.K. number) to get someone over to meet me at the reception area and hand me over the apartment keys. Bookings accomation facilities stated that credit card payment accepted. However the owner refused to accept credit card and demanded cash only. This initially caused us a lot of inconvenience as we were not prepared for it. @Bookings.com kindly investigate and update your information as could cause problems for future travellers. there is a deposit of 3.000 THB and an additional fee for electric power of 80 THB / day and a cleaning fee of 700 THB to be paid. We have not been aware of this as the price on booking.com say "final end price" but this money comes on top and will be deducted from your deposit. Make sure to calculate this add-on for yourself google about thai immigration registration law and be sure that everything will work as the thai law wants it to be for you. In case you not register correct some problem and penalty might be on you list. The "management" was not very helpful on this topic and it needed some pressure to get the needed documents to do the registration on my own. They will not do the registration for you. furthermore thai law not allows short-term-rentals (< 30 days) in condo like this. try to look on the internet about the problems that might occur. We were the first ones to rent this apartment so there were lots of missing items that we are used to when renting an apartment. We got many of the required things after a couple of days. We asked for an extra bed for an adult and didn't get a sleepable bed until 2 days later. There is still need to buy more things to apartment. It would be nice to get a pamplet with information in the room, like were to find the gym and restaurant, numbers in case of an emergency. No proper chairs on the balcony and no drying racket. The BHT 1000 for end cleaning should be included in the price. There was charge 1,000 bath .actually while contacted by email they informed 800 baht. No information in where to get keys especially when we arrived at 2 am and we cannot get a hold of the contact person right away. Clise to restaurants and beach.